An orphaned boy in Bihar has been begging on the streets for several days to collect money to “bribe” the local police. 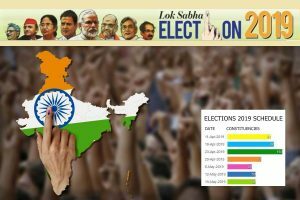 The incident has come as an embarrassment to the Nitish Kumar government which claims to have launched a crackdown on corruption. The boy, Vivek Kumar, who hails from Chehrakalan village under Kathara police outpost in Vaishali district recently approached the local police for help when influential villagers tried to grab his land. The local police station in-charge Rakesh Ranjan allegedly sought a bribe of Rs 10,000 for providing him help. 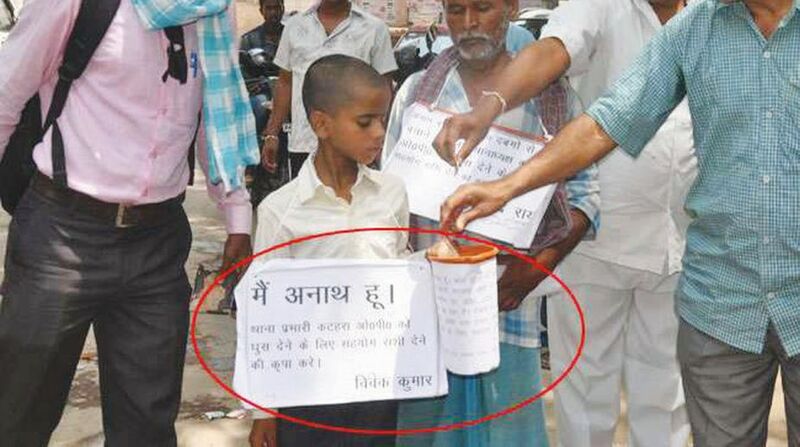 Vivek went to the district collectorate and sought alms from visitors with a placard reading “I am an orphan. Please help me with contribution money to be paid to the local thana in-charge as bribe”. This caught the attention of the local media. The local administration has taken the matter up and directed the sub-divisional police officer to remove encroachments from Vivek’s land. The local district magistrate Sarv Narayan Yadav issued the order after getting details from Vivek. A similar incident had come to light in November last year when a little boy was forced to beg on the streets of Madhepura after a private hospital refused to release his mother without paying a huge bils. The local MP Pappu Yadav finally stepped in and helped out the family. The victim Lalti Devi had been admitted to a local government hospital in Madhepura after she complained of stomach ache but the doctors referred her to a local private hospital, terming her case serious. This hospital too didn’t treat the woman and referred her to a private nursing home in Patna, saying she needed to be operated soon as her baby had died in her womb. The doctors at the hospital operated on the woman and removed the foetus but handed her a bill of Rs 70,000. As the family was unable to pay the amount, the patient was held hostage at the hospital and doctors refused to remove her stitches although her wounds had healed. A local journalist highlighted her story, describing how her seven-year-old son Kundan Kumar had been seeking alms to raise money to free his mother. By the time Pappu Yadav came to her rescue, the boy had collected Rs 13,000 as donations.